As a caregiver of someone who is living with dementia, you will experience a variety of different care options at the different stages of your loved one’s disease. In the beginning, you may be able to provide care for your loved one in his or her own home. There may be times where you encounter a need for a temporary care arrangement so you can get some rest or take a vacation. Respite care and day respite care are some options that may be available to you. After time and as the dementia progresses, it may become necessary to move your loved one into a residential care facility where your loved one can receive individualized care. In the final stages of dementia, you may encounter hospice as a final care option for your loved one. While it may be unsettling to consider hospice, it can help to understand what hospice is and how it can help your loved one. Hospice is a type of specialized care for individuals facing a life-limiting illness, their families and their caregivers. Hospice care addresses the patient’s physical, emotional, social and spiritual needs and helps the patient’s family and caregivers provide the care needed. It focuses on comfort and quality of life rather than a cure. The ultimate goal of hospice care is to enable the patient to have an alert, pain free life while living each day as fully as possible. 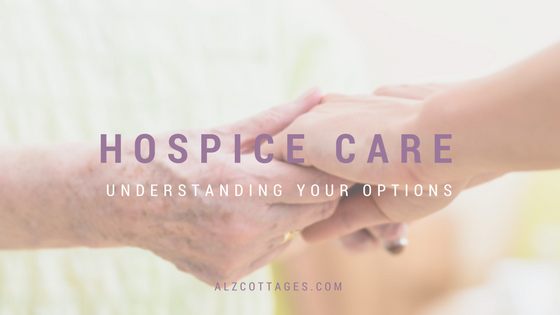 Hospice is a sensitive subject, and understandably so. Despite the growth in awareness in hospice care over the last several years, there continues to be huge misconceptions about hospice. Hospice can improve quality of life for the patient because his or her symptoms are better managed. Living pain-free in the final days or weeks means more time to enjoy with loved ones. Many people are reluctant to pursue or look into hospice care for their loved ones because they fear it means giving up hope, that their loved one will no longer receive care or because they don’t think their loved one is close enough to death to be eligible for hospice. While hope takes on a different look in hospice, it isn’t given up. Hope now may mean hope for living pain-free instead of looking for a cure. It may mean hope for living each day to the fullest and spending quality time with family and friends. Hospice is generally paid for through the Medicare Hospice Benefit, Medicaid Hospice Benefit and most private insurers. If someone does not have coverage, hospice will work with the individual and their family to ensure needed services can be provided. Most hospice is covered by Medicare, which requires patients to be diagnosed with a terminal illness, be 65 years of age or older and have the patient’s doctor and a hospice medical director certify that the patient has six months or less to live. In spite of the length of time coverage is provided, often patients are admitted only a few days before death, possibly either because the family and/or patient are not ready until the patient is very close to death or because no one really understands all the benefits hospice can provide to a patient even months before death. If you think your loved one may be nearing the time to enter hospice, or would like to know more about the specific care your loved one may receive on hospice, speak to your loved one’s physician.